Foreign Minister Kang Kyung-hwa reaffirmed Wednesday that the complete denuclearization of the Korean Peninsula is a shared goal of South Korea and the US, stressing close cooperation between the two countries. “Denuclearization talks will begin in earnest based on strategies that have been mediated between South Korea and the US. … I expect there will be great progress in denuclearization, inter-Korean relations and lasting peace settlement if a second North Korea-US summit and North Korean leader Kim Jong-un’s visit to Seoul take place,” Kang said during a press conference in Seoul. Asked if upcoming negotiations between North Korea and the US would focus on dismantling North Korea’s intercontinental ballistic missiles -- potentially capable of striking the US -- rather than comprehensive ways for denuclearization, Kang said Seoul and Washington share the common interests of peace and stability in the Korean Peninsula and Northeast Asia and the complete denuclearization of North Korea. Concerns have been mounting here following US Secretary of State Mike Pompeo’s remark last week that the security of the American people is the ultimate objective while commenting on talks with the North. Some observers have interpreted his remarks as indicating a shift in the agenda to a nuclear freeze rather than complete denuclearization. “It is unreasonable to attach policy implications to a single comment,” said Kang. Kang’s remarks came as Pompeo and top North Korean official Kim Yong-chol are expected to hold a meeting in Washington this weekend to prepare for the second summit. 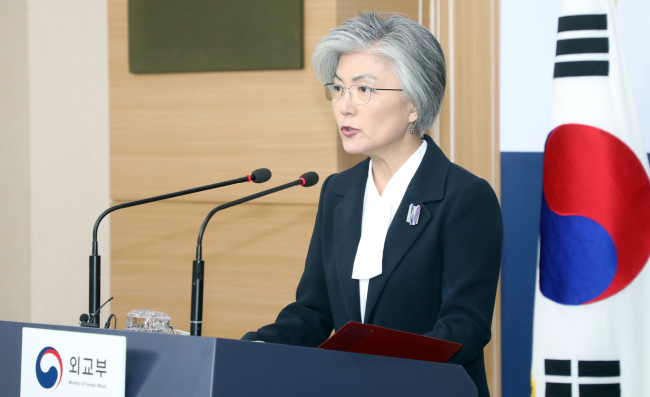 Regarding a road map for denuclearization, she said the South’s basic approach is a comprehensive agreement with a step-by-step implementation process. She said corresponding measures for North Korea when it takes steps to dismantle its nuclear weapons would be a combination of various incentives and may include the formalization of the end of the 1950-53 Korean War, humanitarian assistance and establishment of a communication channel with the US. “If the North and the US reach a deal (for corresponding measures), that agreement would be one that had been discussed with us,” she said. The minister added that there is “unprecedented close communication” between South Korea and the US, and that she is arranging a meeting with Pompeo next week in Davos, Switzerland, as the two are set to attend the World Economic Forum that kicks off next week. Two key inter-Korean economic projects, however, are not under consideration as potential incentives for Pyongyang. In his New Year’s speech, North Korean leader Kim Jong-un said he is willing to reopen the joint industrial park in the North’s border town of Kaesong and resume a suspended tourism program to Kumgangsan without preconditions. “For now, our government is not at a stage to review the resumption of the Kaesong industrial complex and Kumgangsan. ... I think, eventually, a specific result will emerge at the North Korea-US negotiating table.” Kang said.